Inspire your email designs with this top 5 email design boards on pinterest. 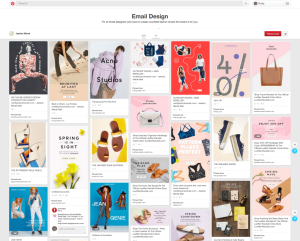 Pinterest pinner “Email” has a large collection of 75 email design boards organized by industry and category. With examples as specific as abandoned baskets to account validation emails, these boards have inspiring examples for almost every type of campaign. Canva is a tool for graphic design and photo editing. Their Email Designs board called “Some of the most awesome emails we’ve seen on the web” is the perfect place to visit for email design inspiration. Their board is colorful and filled with beautiful emails. Jessica Marak is a graphic designer whose board is “for all those designers who have to create countless fashion emails.” Filled with creative emails from some of the most relevant experts, the board is a great resource for product promotion emails including colorful styles and beautiful designs. Creative Nerds email design board is a dynamic collection of bright and colorful emails. Creative Nerds adds insightful comments on pins, too, pointing out how specific design techniques make the email successful. Mocca is an Australian marketing and design company with 71 boards on Pinterest. “We just love design,” they state. Their email design board includes hundreds of pins and has all kinds of emails, from branding to artistic types. It’s a very good resource for e-commerce business. Use your inspiration within our drag and drop email template builder or choose one of our ready to use templates.